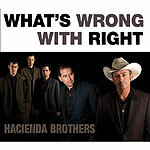 CD review: "What's Wrong With Right"
This review first appeared in Turbula in July 2006. The Hacienda Brothers are an intriguing amalgam to begin with: the two founders/ leaders are Dave Gonzalez, with his incisive, blues-tinged guitar riffs, and Chris Gaffney and his border-Mex accordion from East L.A. and rough-hewn vocals. When you add legendary blue-eyed soul songerwriter and producer Dan Penn to the mix on the band's second album (as on the first), you end up with a Southern friend honky tonk Mex-soul blues stew that's as tasty as it is spicy. The country groove here is stronger than anything Gaffney or Gonzalez have done on earlier projects, yet it is always leavened with all the other influences of the band's two leaders. And in the tight horn charts and the gospel-infused vocal harmony arrangements, Penn's Muscle Shoals influences is unmistakeable. Gonzalez, who served for years as frontman for the San Diego-based blues trio the Paladins (and is a longtime Encinitas resident), wrote or co-wrote seven of the 13 tracks here. Fans of his blues-roots songs with The Paladins may be surprised to hear how fully he is able to immerse himself into the country vibe on his new songs. "The Last Time" is deep honky tonk, a song that would fit quite comfortably into George Jones' next set; "Son of Saguaro" is an instrumental mood piece not so far removed from the soundtracks to Clint Eastwood's old spaghetti westerns. Despite the strong selection of songs from Gonzalez and Penn, though, perhaps it is a cover of Gamble and Huff's "Cowboys to Girls" that distills the Hacienda Brother's magic most purely. A soul song of the Philly school, 'Cowboys to Girls" is given a country-western arrangement while leaving its basic structure in place. It is urban and backcountry, r&B and country all at the same time. Few bands could pull off such a feat  what is most amazing is that the Hacienda Brothers pull it off on 13 songs in a row here.